According to Statistics Finland, the housing costs of owner-occupied dwellings increased by 0.2 per cent in the third quarter of 2016 from the respective quarter of 2015. According to preliminary data, the price of buying a dwelling went up by 1.1 per cent from the corresponding period. 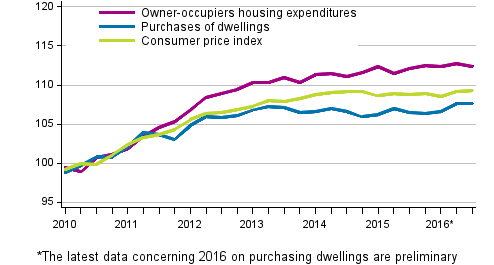 Compared with the previous quarter, the housing costs of owner-occupied dwellings fell by 0.3 per cent and the price for purchasing of dwellings remained unchanged. ISSN=2341-6971. 3rd quarter 2016. Helsinki: Statistics Finland [referred: 20.4.2019].